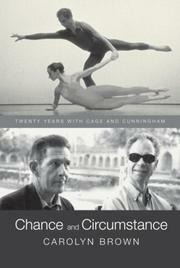 A diary of the author’s two decades with Merce Cunningham’s company. Brown first encountered Cunningham’s cutting-edge choreography while taking a two-day master class given during his 1951 cross-country tour with composer John Cage. She was living in Denver with her husband, a composer in the modern style of Schoenberg and Webern. Though she’d studied dance since age three and danced throughout her time at Wheaton College, she wasn’t sure that was what she wanted to do professionally. But the newlyweds were inspired by Cage, who had studied with Schoenberg, and Cunningham, a former Martha Graham dancer. They decided to move to New York and try their bohemian luck. Brown began to take classes with Cunningham, whose choreography she describes as “spare, intractable, yet classical.” The first work she learned was the seminal Suite by Chance, set to Cage’s “chance experiments” in music. Although there was no money to speak of, Cunningham invited a small core of dancers to join him in the summer of 1953 at North Carolina’s Black Mountain College, where a fledgling company was born. Brown toured all over the world with Cunningham, and critical reviews spread about their controversial “chance dances.” Painter Robert Rauschenberg, then struggling like the rest of them, became smitten with Cunningham’s work and contributed to the production of more than 20 dances before leaving the company in 1964. The next few years were lean ones, but Brown and others maintained a remarkable commitment to Cunningham’s vision. Notables in the world of dance, art, music and letters walk casually through the pages of this story, although the author never grows sentimental or self-absorbed. Readers looking for gossip won’t find much here—Brown worships her hero. A long-winded, year-by-year chronicle of 20 years in modern dance.